Badlands National Park is located in southwestern South Dakota in America. Raised landscape here resembles an alien land from a science fiction film. The general plain here is formed by rugged rock formations, with erided hills and sharp toothed peaks. These dome-shaped hills and canyons crawl up the striated prairie area that is as scary as it is magnificent and mysterious. This inhospitable region initially scares with the coldness, which it radiates, but the red-yellow-striped cliffs are a really beautiful sight. In addition to the rock formations, the park contains the largest protected mixed grass prairies in the United States. In addition, here is the home of one endangered species such as black mink. The 64, 000-acre prairie is the richest in fossils from the Oligocene epoch of the valley beds, dating from about 20-35 million years. Nearly 11 thousand years ago, people used the area of Badlands for hunting and chasing around the wild bison, rabbits and other animals. The Sioux tribe of Indians called the area of the national park "mako Sica, " which translates to poor land. Similar is the name of the prairie given by the first French settlers who came from Canada. 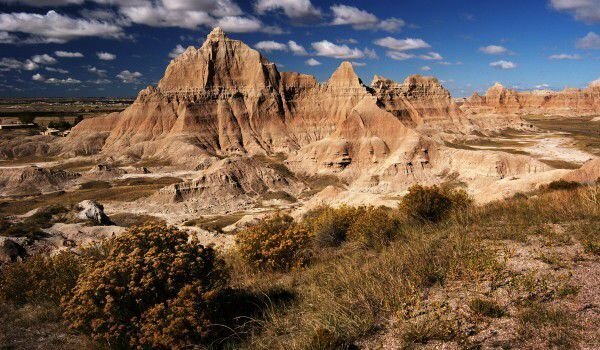 They named Badlands "Le Terre movez and sleepers" or difficult to pass land. Jagged rock shapes are formed here before about 500 thousand years ago, when the water had begun to invade and shape the rock layers. Unique peaks are the result of strong erosion, which in one year increased by about 2 5 cm. It is estimated that this rate of deterioration after 500 thousand years hills will disappear completely. Best time to visit the park during the year is in spring or autumn. Transport here requires you to land at the nearest airport, in Rapid City and Sioux Falls. From there to Badlands, there are roads that pass through the territory of the park itself.